Two years after Taylor Swift donated $10,000 to a 5-year-old boy with autism for a therapy dog, the Grammy winner surprised his family front-row seats and backstage passes for her NRG Stadium show in Houston. The young fan and his service dog, Reid, shared the special moment with his mother, Allison Hill and sister, Jordan Fox. “Taylor Swift was so kind,” Allison said in a Facebook post by Autism Speaks. “He grabbed her face and pulled her hair back and said ‘Hi Taylor!’ which was something we were working on all week but didn’t know if he would be able to say it,” she wrote of the pair’s interaction. The meeting was made possible after Swift discovered Jacob’s 12-year-old sister and cousin cover of her hit ‘Blank Space’ in 2016. Watch that below. 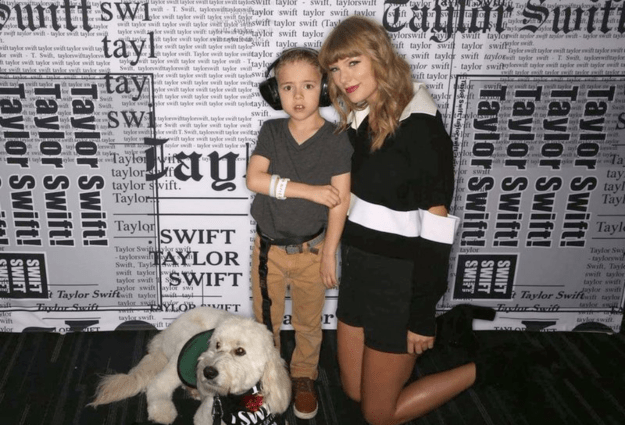 A month after her son received his service dog, Allison wrote the open letter entitled: “When Taylor Swift Gave My Son With Autism a Life-Changing Gift”. Read that here.